It's been a rather exciting day yesterday, with the launch of Soyuz, carrying 3 astronauts including Tim Peake, Britain’s first European Space Agency (ESA) astronaut. My kids came home having watched the launch live at school and my 7 year old exclaimed "I don't know what to choose, an astronaut, a scientist or a musician" My reply off course was, you can do all three - a space scientist that plays guitar! Such fantastical dreams seem more plausible as kids witness events like the launch of the Principia Mission. We got a littleBits Space Kit for Christmas, but I just couldn't resist getting it out with the kids, as we were all very excited about space. 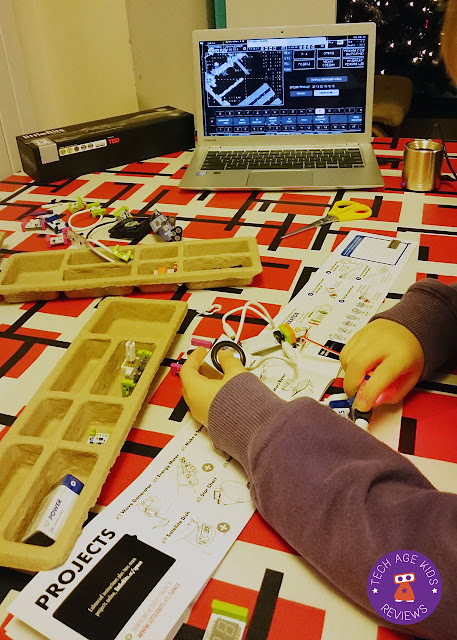 At Tech Age Kids, we really like littleBits as a tool to explore with electronic designs and inventions. There are a variety of different kits and so understanding what you get in the kit and what you can build with it, can help your purchase decision. littleBits is a fantastic company and have won awards for their kits. Their Gizmos and Gadgets set, which we reviewed earlier this year, received rave reviews from New York Times, saying it's "Tech Toys to inspire a Child's Imagination". Special Offer: Get a free mini-synth music bundle with any order over $199. Use code MUSIC. Earlier in the year I bought a Premium Kit for my son's birthday and we've made some fun things, including a bubble machine for his party. (It was a huge hit with his friends). 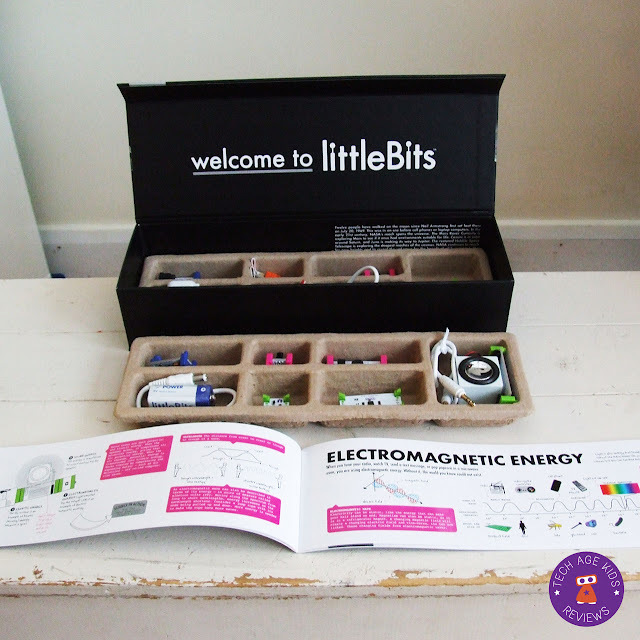 The Space Kit was on an excellent offer and we decided to expand our littleBits collection. We were very excited to get a few additional "special" Bits from the Space Kit. littleBits works a bit like LEGO sets, each set is a standalone kit with it's own projects and possibilities for inventions. With additional kits you can invent more and try out different electrical components. So in the Space Kit we got a DC motor, a speaker, microphone, light sensor, digital number display, infrared (IR) LED and trigger and two power Bits. In fact apart from a couple Bits, we've done very well to expand our littleBits collection with the Space Kit. The box is sturdy enough to use as storage for your littleBits and cleverly designed in black with shiny silver. A real space look and feel. The age recommendation for the Space Kit is 14+ however I explored the kit yesterday with my 7 year old. He is very interested in science and enjoyed to figure out what happens if you click different Bits together. His favourite Bits were the speaker, microphone and IR LED and trigger, which he used to make a microphone to announce the rocket launch countdown. The kit makes a fantastic tool to learn science concepts, which to be fair is too advance for my 7 year old to comprehend. However working together and explaining the science at his level, we learned loads. My teen (currently writing exams) briefly played with the kit and was impressed with the variety of Bits, clicked some together to make a light sensor and turned it into a game for his younger sibling using the number Bit. The Bits are delicate and real electrical components so we recommend younger children to use it alongside adults or older siblings. The booklet, which comes in the box, contains 10 activities which were developed in partnership with NASA Goddard Space Flight Centre. For tweens and teens, the Space Kit can help bring science to life as you can explore different types of energy, electromagnetic energy, and sound and light waves. Many of the projects ask you to collect data and test your hypotheses. littleBits encourages an online community of makers to share projects and so you can find more inventions online. We're planning to make the Mars Rover (7 year old's choice) once we've collected all the materials. Subscribe to our email list, to read about our project later. 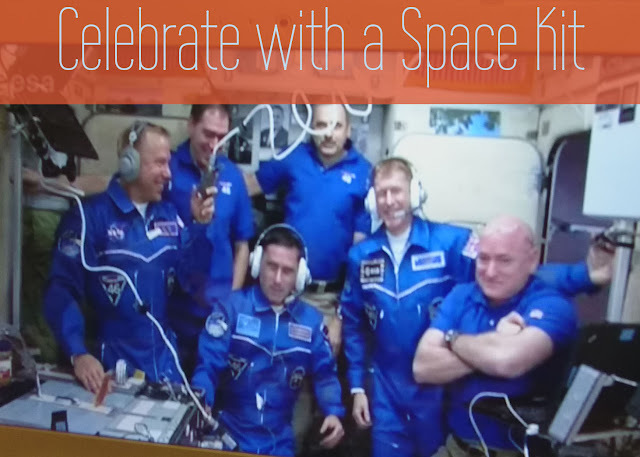 The Space Kit is a great set to explore earth and space science with your kids at home. We like that it contains a good range of different components, which can also be used to make other inventions, which isn't necessarily space-science related. The 14+ age recommendation, we believe is due to the complexity of the science concepts explored with the Space Kit. However other littleBits kits have age ratings of 8+ and so we recommend, this kit could be suitable as a expansion kit for a younger littleBits enthusiast. The Gizmos and Gadgets Kit would be our recommendation for a family with younger kids, as it comes with a good selection of Bits for making. Space exploration has certainly gained popularity this week, with the launch of Soyuz carrying 3 astronauts (space scientists) to the International Space Station. Happy space exploration with the kids. HURRY as, today is the last day you can order your littleBits Kits to get them before Christmas and get free shipping if you spend $60.